Chefs are artists: a plate serves as a canvas holding a perfect assemblage of different ingredients. 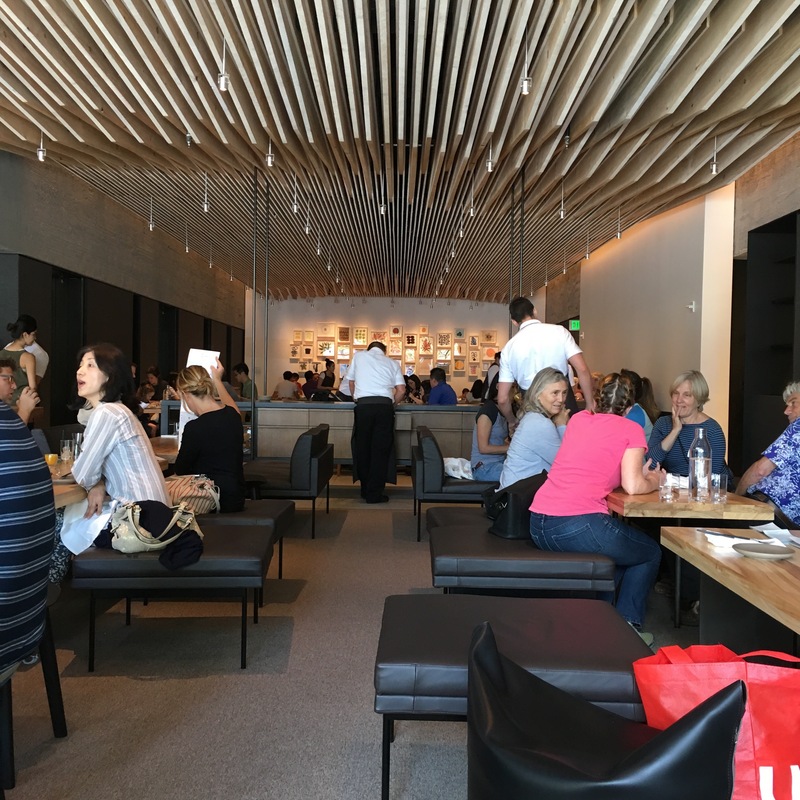 No where is this more apparent and apropos than at In Situ, Owner/Chef Corey Lee’s latest restaurant located inside the newly expanded SFMOMA (San Francisco Museum of Modern Art). Instead of creating his own menu for his latest foray, the 3-Michelin starred Chef Lee decided to open a “food exhibit” where the most iconic dishes of the world’s best chefs are precisely recreated. 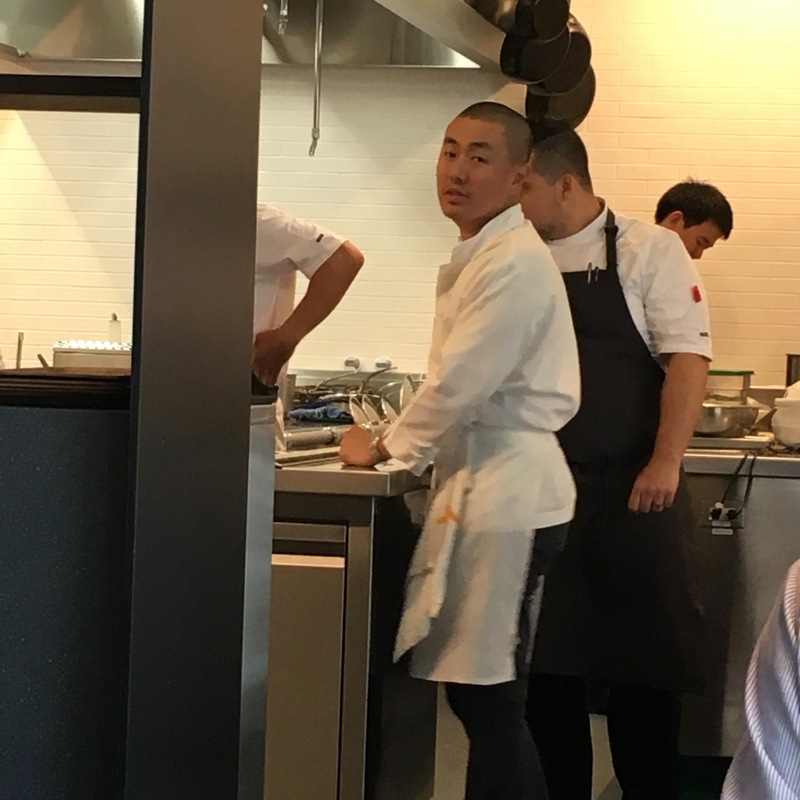 Chef Lee, Executive Chef Brandon Rodgers and other team members have collaborated with almost 100 different chefs to get the recipes that will go into In Situ’s rotation. To get the exact technique down for each dish, they locally hosted or traveled extensively to visit the originating chef. It’s definitely a unique approach, and it’s great to see these chefs, many of whom are Michelin-starred, are willing to share their recipes. Personally we love the concept, as it gives us access to trying out restaurants we have often heard about but will likely never get to. In Situ, latin for “in place” or “on the premises” is a museum exhibit in itself. It is comprised of a formal dining restaurant and a lounge, each with its own distinct menu. The smaller plates from the lounge menu cannot be ordered when dining in the restaurant and vice versa. We made the pleasant mistake of showing up a week ahead of our dining room reservation and decided to stay and experience the lounge menu. This photo shows the length of the In Situ with the lounge in the foreground and the dining room is behind the buffet table towards the back. The decor is simple and modern, befitting the museum surroundings. We chose seats along the window banquette in the lounge and proceeded with the first of our two meals (so far) there. The menu lists the name of the dish, the chef and the year the item was created – much like a piece of art on the wall. As fans of fried poultry, we had to start with the Buttermilk Fried Chicken & Pine Salt by Chef Isaac McHale at The Clove Club in London. We never would fathom that a British chef could have such a great take, developed in 2008, on an iconic American dish. 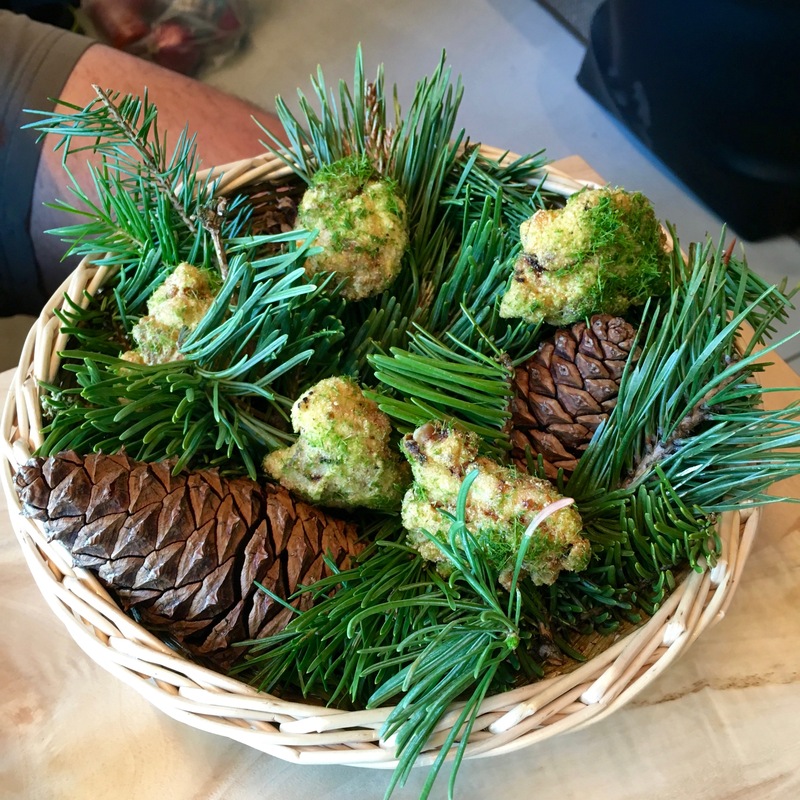 The chicken nuggets are dusted with pine salt, which added a light herbal flavor that was enhanced by the aroma of pine leaves and cones wafting from the bowl. We overheard that this dish was initially on the restaurant menu and was so popular that the kitchen couldn’t keep up with the orders, so it was moved to the lounge menu. Not sure if that helped since we noticed that just about every table in the lounge ordered at least one of these baskets. What’s great about In Situs’s recipe curation is that it’s not all from super high end restaurants; some of the dishes are comfort food great and approachable. A perfect example of this is the sating Ketchup Fried Rice by Los Angeles’ Kogi food truck magnate Roy Choi from his L.A. Son cookbook. Wondering if the kitchen made their own ketchup, we recalled that they make it as the originating chef does, so it was probably Heinz. 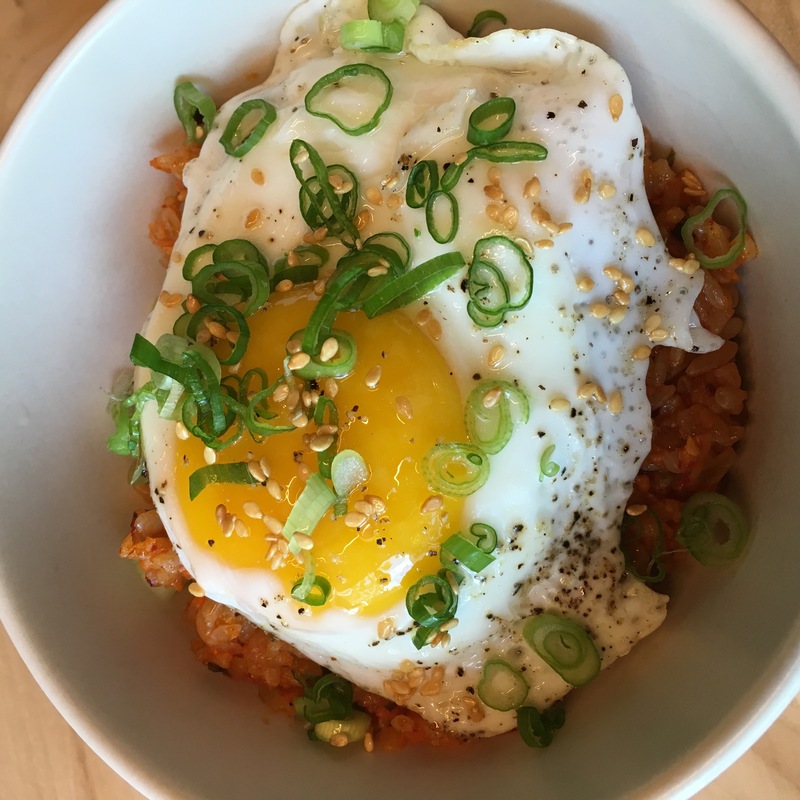 The fried rice studded with carrots and scallion was lightly spicy with kimchee flavoring (recipe). We mixed in the egg and zealously partook in emptying the bowl. Next up was the Lettuce Sandwich from Michelin-starred Relæ restaurant by Chef Christian Puglisi in Copenhagen, Denmark. 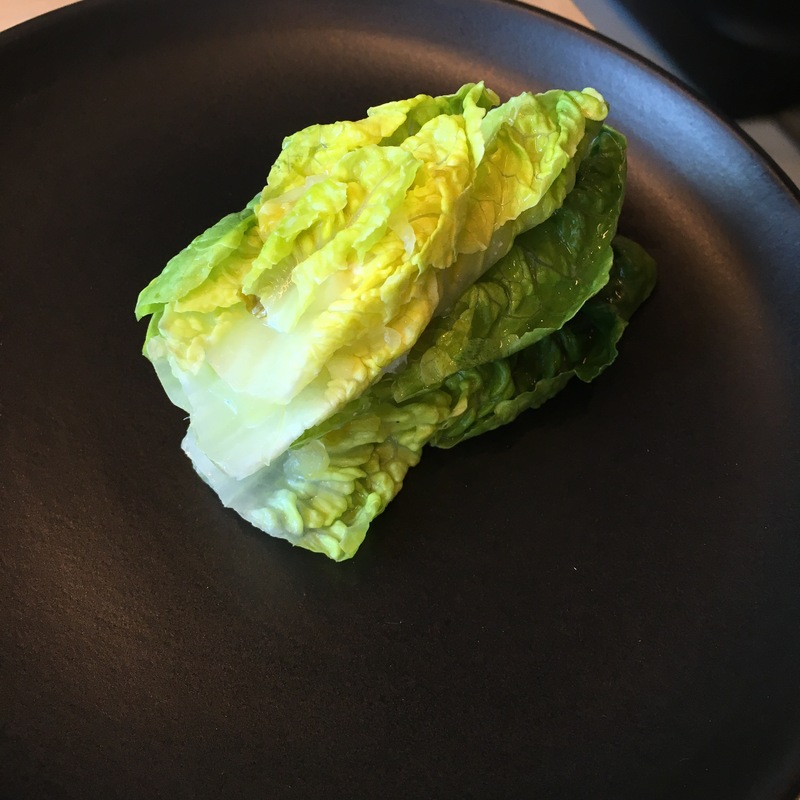 This 2015 dish featured stacks of baby lettuce leaves interleaved with a spread made from fermented romaine, goat cheese and olive oil. It was a study in simplicity that we were glad we tried, but it wasn’t our favorite dish off the menu. Next up was the Dadinhos de Tapioca from Chef Rodrigo Oliveira of Mocotó restaurant in São Paulo, Brazil. 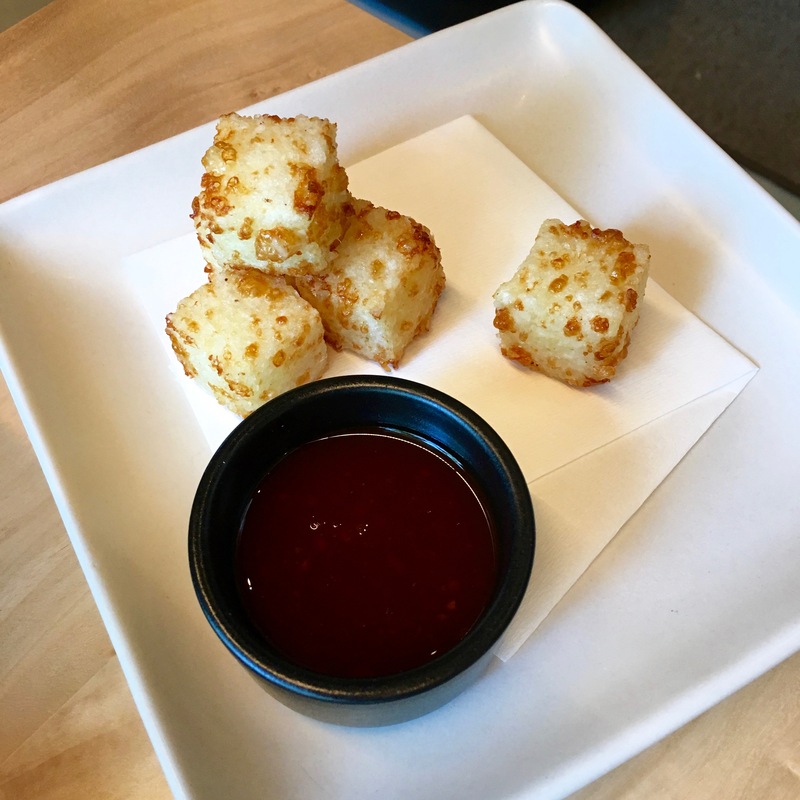 Created in 2005, these tapioca and cheese fritters (recipe) served with a sweet and spicy chili sauce were nice and crisp on the outside and slightly chewy on the inside. Despite being labeled a lounge, there is no visible bar at In Situ. They have a full liquor license and offer about half a dozen mixed cocktails and a spirit list. Their curated wine list is fairly short but it does have wine from many different regions in the world. 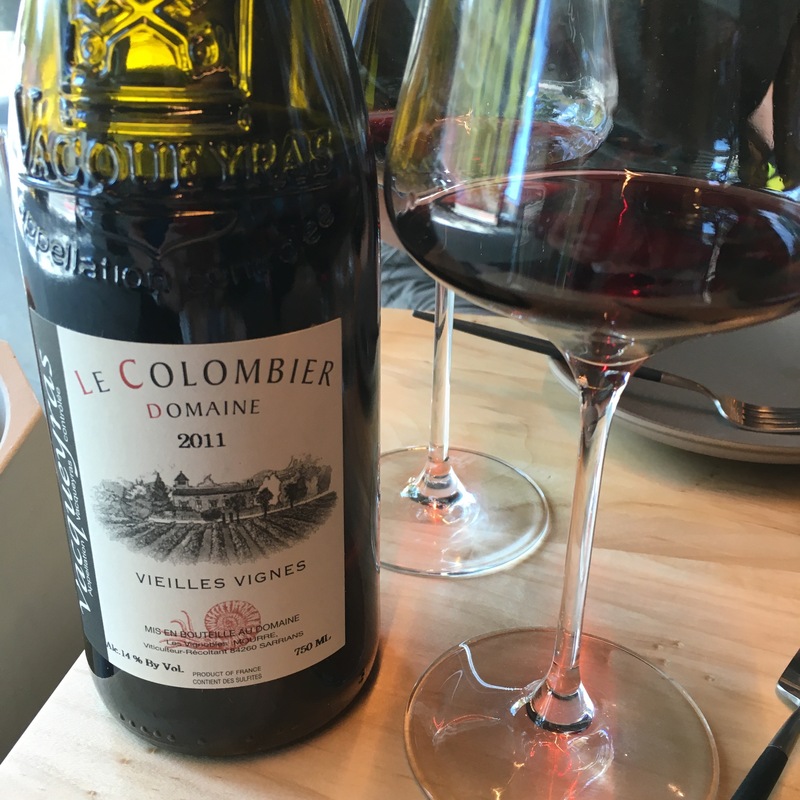 For our lounge outing, we opted to get the 2011 Le Colombier, Vielles Vines Vacqueyras from the Rhône region of France. The Summery Warm Tomato & Basil Tart by Michel Guérard from the three Michelin-starred Les Prés d’eugenie located in Eugénie-les-Bains, France was truly spectacular and makes the lounge worthy of a visit. “Born” in 1981, this tart should live on the menu for many ages to come. 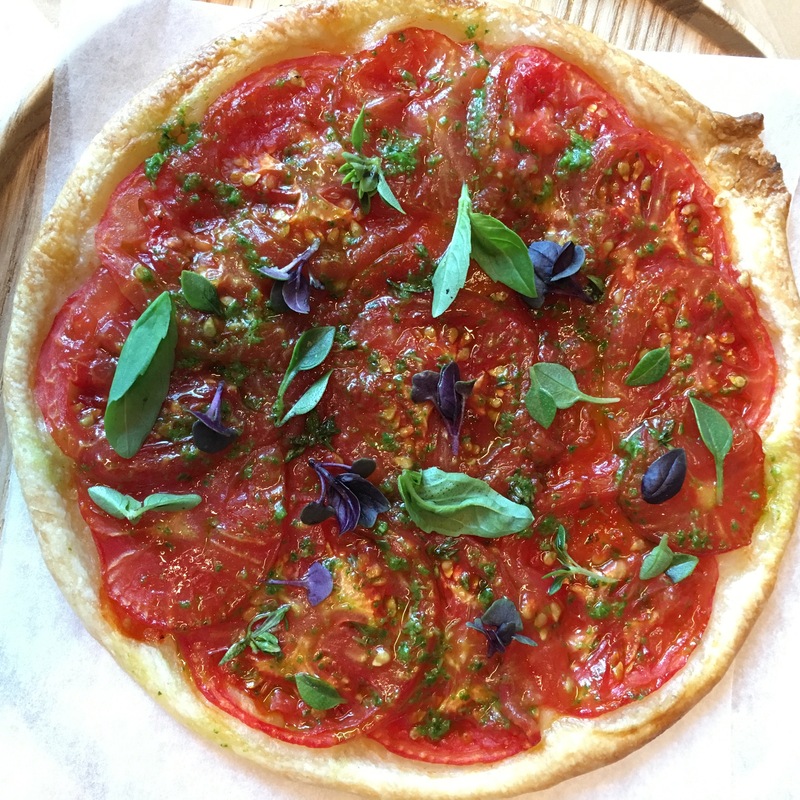 The lightly dried thin slices of tomatoes brought out their sweetness which perfectly matched the buttery flavor of the thin and crispy pastry crust. It was a marvel that a quarter slice could be picked up and held all of the juicy fruit topped with just enough basil leaves. We made a note to visit and stay at Eugenie the next time we visit San Sebastián in Spain, as it is close by. We were pretty full at this point but had to try Cronut-creator Dominique Ansel’s Sage Smoked Dark Chocolate Brownie. The circa-2015 brownie arrived to our table with a lit sage leaf that we were instructed not to eat. 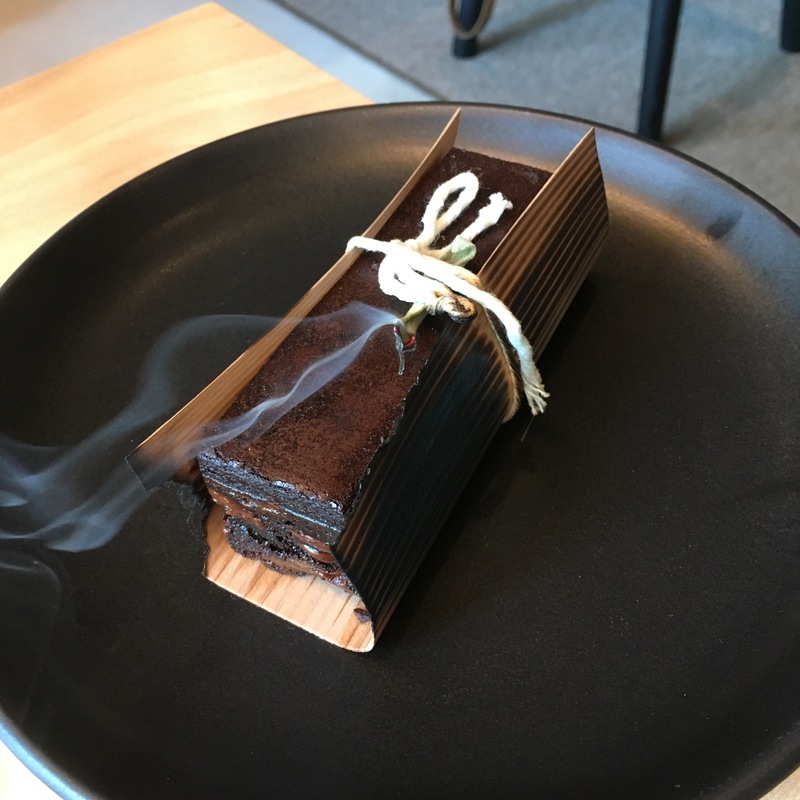 We unwrapped the pretty package and commenced eating the rich brownie that might have been a tad too sweet for us (but we’re not normally dessert eaters). We spied Owner/Chef Corey Lee in the kitchen from our window seating vantage point. We returned a week later to eat lunch in the formal dining room. The menu itself, presented in the form of a folded map, is very informative with information about each of the chefs and their restaurant. This incarnation features a dozen savory dishes in small to large formats along with three desserts. We started with Wylie Dufresne’s Shrimp Grits from the now defunct wd~50 restaurant in New York. 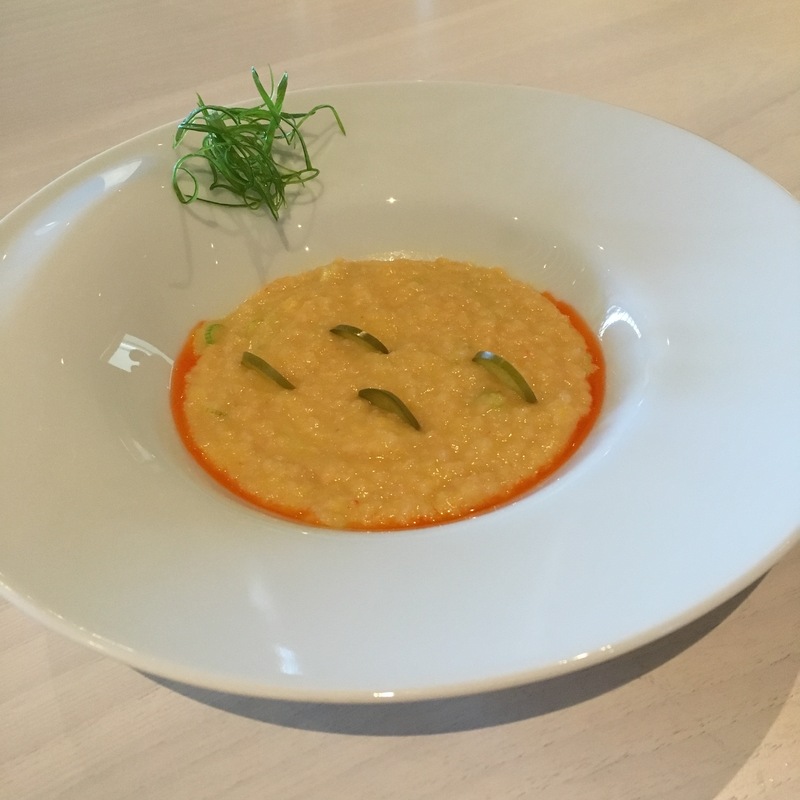 True to modernist cuisine form where everything is not always as they seem, ground shrimp flavored with dehydrated corn serves as the grits in this deliciously 2013 version. The shrimp oil added a nicely intense shellfish flavor, and the pickled jalapeño added texture and some palate respite from the creaminess (recipe). 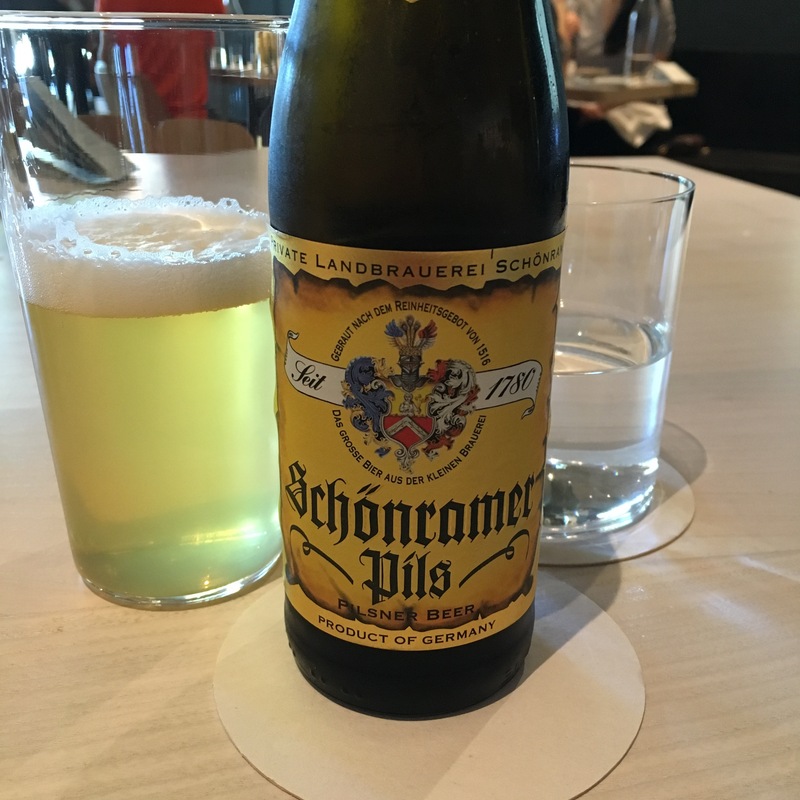 We had mapped out our meal for that visit and determined that spicy dishes would overwhelm any wine, so we decided to go with this pilsner from Salzburg, Germany. 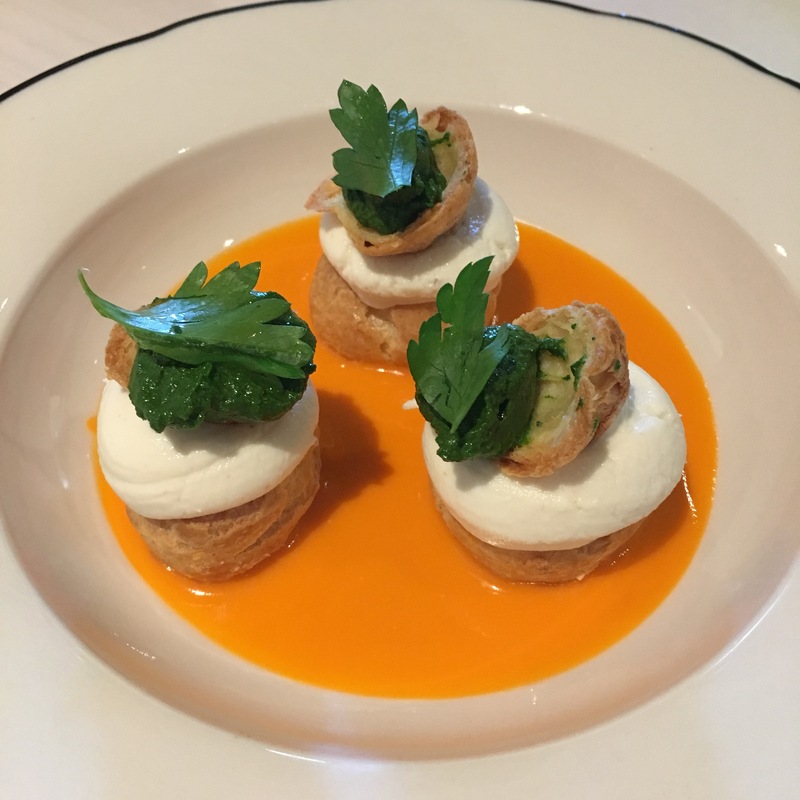 The Celeriac and Goat Cheese Profiterole by chefs David McMillan & Frédéric Morin of Montreal’s Joe Beef restaurant was an excellent upscale take on a classic grilled cheese and tomato soup, created in 1990. The menu bio tells us that Joe Beef is “known for food that is bold, but also thoughtful and elegant.” We can’t come up with a better descriptor for this tasty dish than that. We selected two spicy large dishes to end out meal. We’re big fans of Chef David Chang and his Momofuku empire of restaurants. We’re happy that In Situ has given us an opportunity to locally eat one of his iconic dishes from 2007. 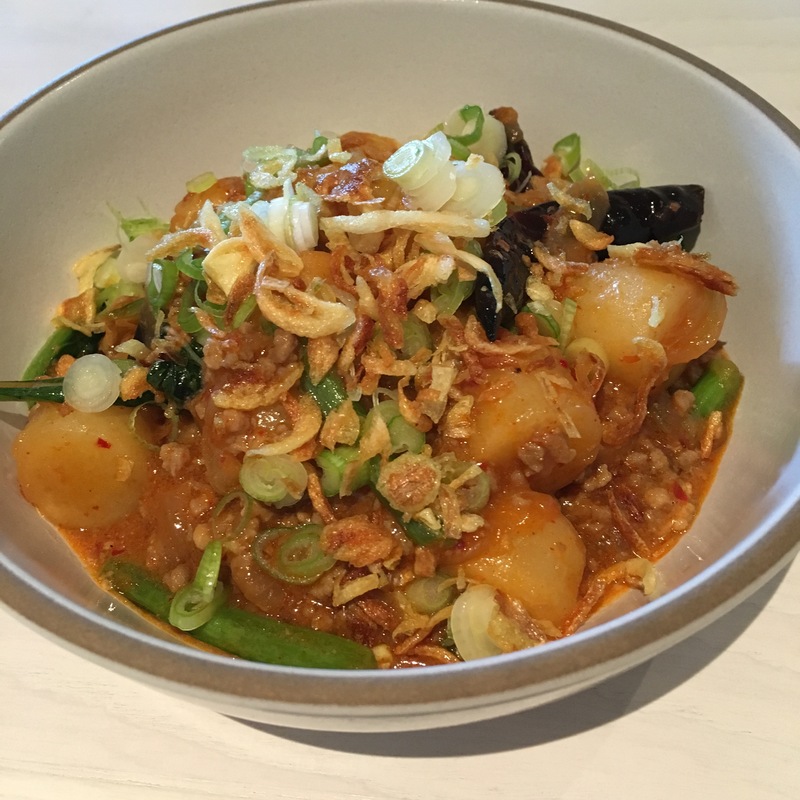 Momofuku Ssäm Bar’s Spicy Pork Sausage Rice Cakes was described to us as Chef Chang’s take on an Asian version of pasta bolognese, but its origin is also that of the sichuan Mapo Tofu dish (recipe and story). The still-chewy rice balls were perfectly accented with numbing sichuan peppercorn. Last up for us was Chef David Thompson’s Guinea Fowl Larp Chiang Mai from his Nahm restaurant located in Bangkok, Thailand. Noted on the menu as “very spicy,” it was delivered as promised. 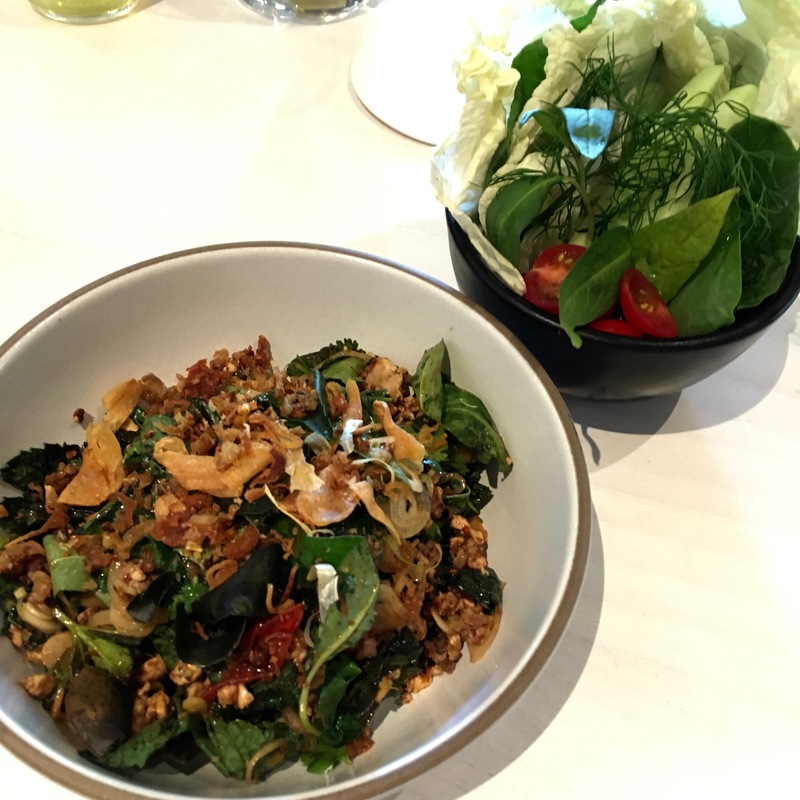 The flavorful ground poultry salad was accompanied by a cupful of raw vegetables and herbs crudites that helped tame the spiciness. 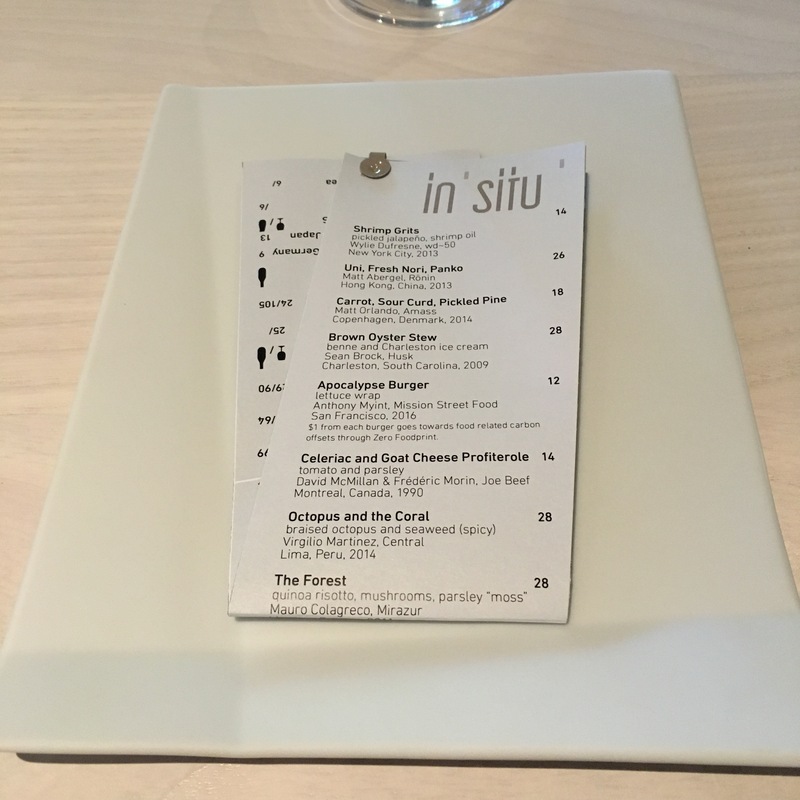 In Situ opened in mid-June and we found that the service and execution were excellent, as if they had been open for many more months. They initially started with lunch service, which may have helped, and only recently started dinner service. The service staff is very knowledgeable of the each of dishes and can help guide the appropriate amount of ordering. We pondered if it made sense to have a restaurant where the menu isn’t cohesive and dishes are literally “all over the map.” But for us, it works. We figure that we are able to partake in at least 10 Michelin stars, and quite possibly a dozen of the world’s best restaurants, without ever leaving San Francisco. It truly is a food exhibit — we look forward to the next installation.